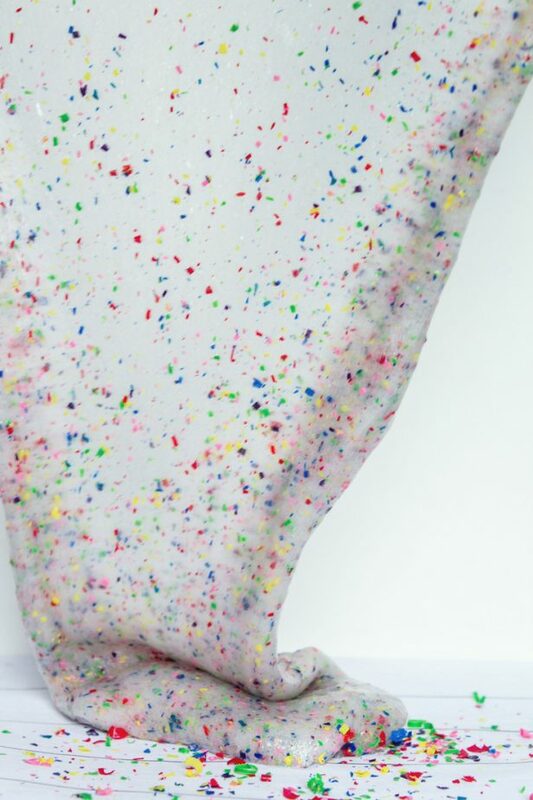 Crayon Slime is the perfect solution to all those broken crayons lying around your home, in your child’s toy box and even buried deep, deep in the bottom of your purse (I can relate HA!). 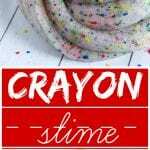 This easy and colorful crayon slime is sure to provide hours of fun throughout the day and help us get through the hottest months of the year. And while we are on the topic – I don’t know about you, but I am ready for summer to be over. With one exception – I don’t want my son to head back-t0-school. 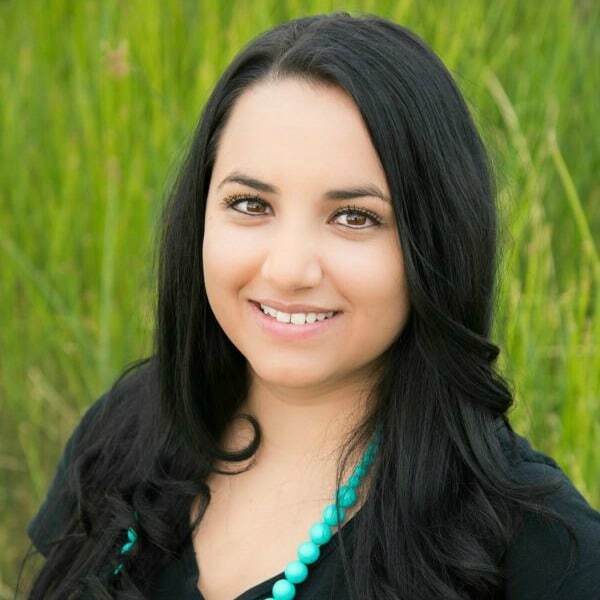 I am talking about, I’m ready for Fall because the weather and gorgeous colors just can’t be beat. That is one major reason I love this crayon slime so much is because of all the added color. 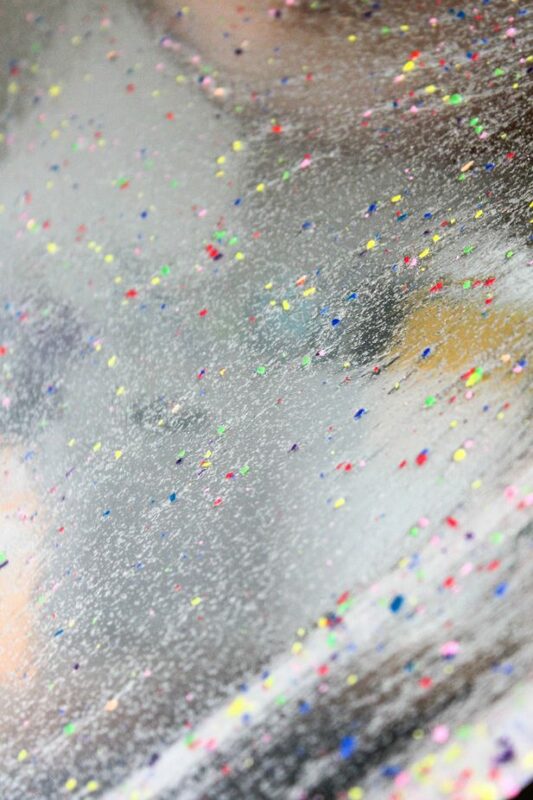 Okay, we totally didn’t use EVERY color of Crayon but you totally can! Notice something *missing* from that list? 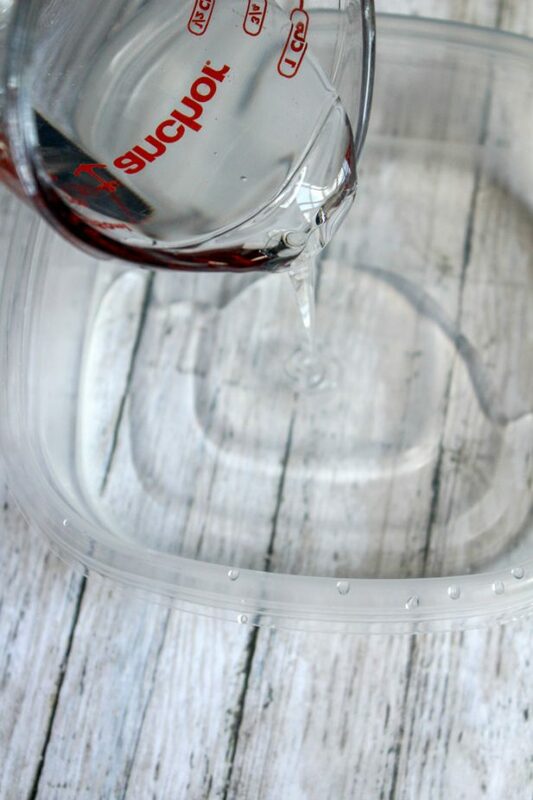 Yup, this recipe is BORAX-FREE! 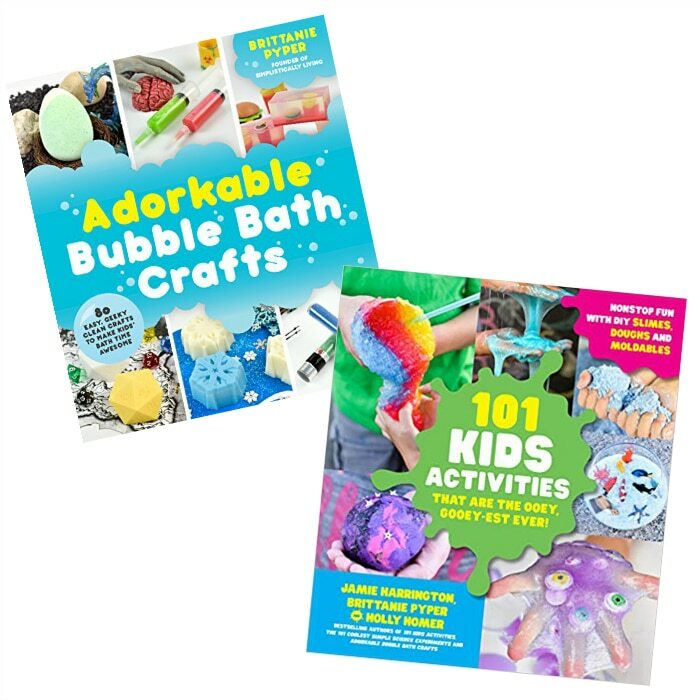 (Just in case you want a slime recipe using borax, we have that too with this glittered orange slime). 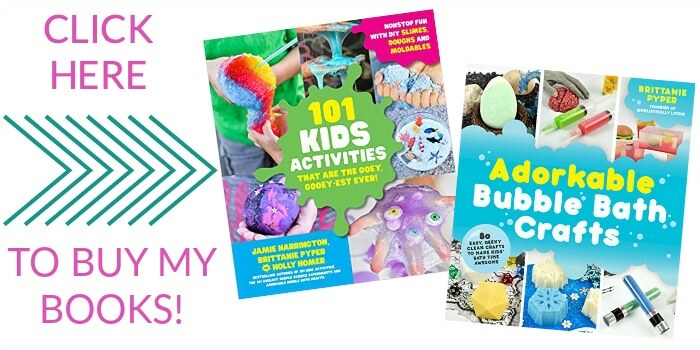 Now, let’s walk you through perfecting this slime recipe. Because, ya know, sometimes something goes wrong and you have to start all over. Let’s avoid that. 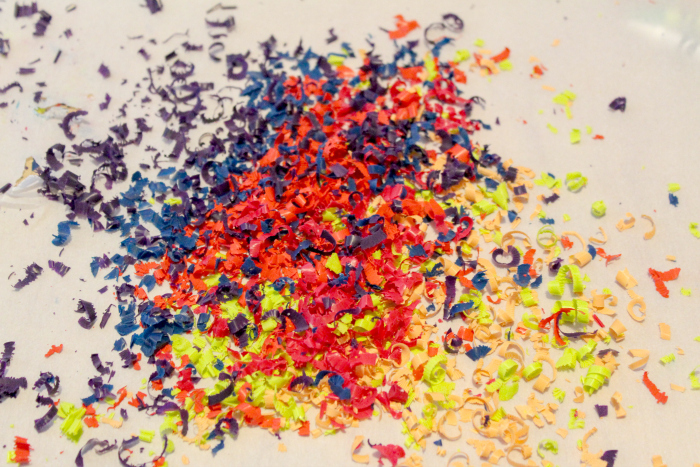 First, you are going to want to shave small pieces of crayon. I used scissors but if you are having your kids help, a vegetable peeler will work just fine. You just want small pieces in multiple colors. We did this over a piece of wax paper so it was easy to transfer to the bowl. 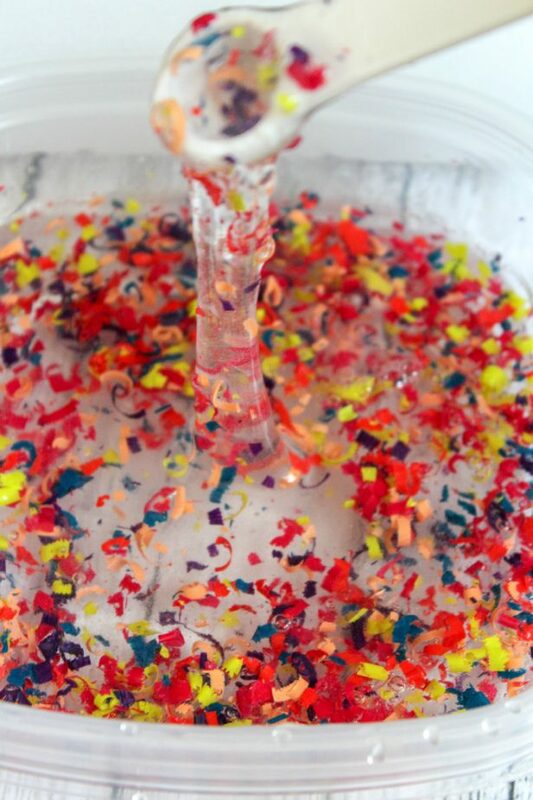 Next, you’ll add your glue to the bowl and then slowly stir in your water, baking soda and crayon shavings. The very last step is to add the contact solution SLOWLY. Okay, seriously though, I cannot stress this enough. Before you add your contact solution you should know that although each slime recipe has specified ingredients (like this one calls for 1 tablespoon of contact solution) you should know that depending on the area you live and elevation, you may not need all of it. Or, if you live in a dry area (like the dessert) you may need a little more. Trust me, mixing slowly will help you get this recipe perfect. You only want to add the contact solution and slowly stir until you start to see the slime form (like above). Once you do, keep mixing until the entire mixture is slimey. If it’s too sticky, add small amounts of contact solution and mix until you can touch it with your finger without having any residue on it. 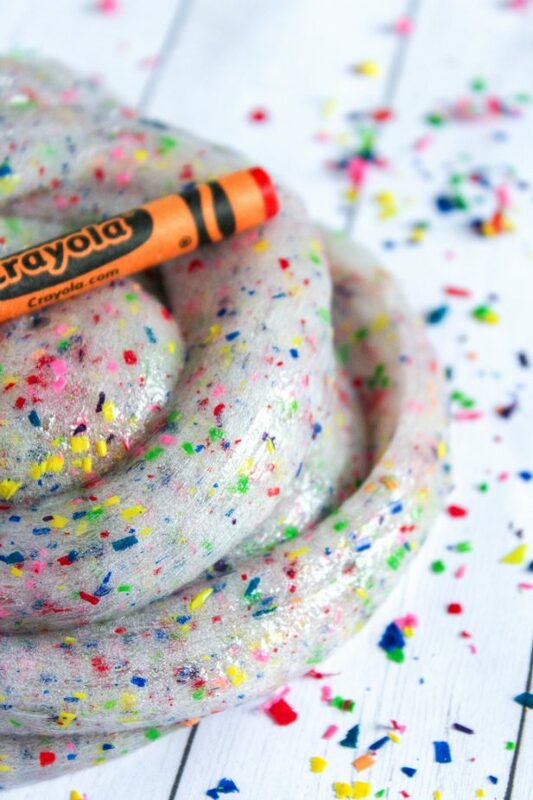 All that is left to do now is play, stretch and mold this beautifully colored Crayon Slime. 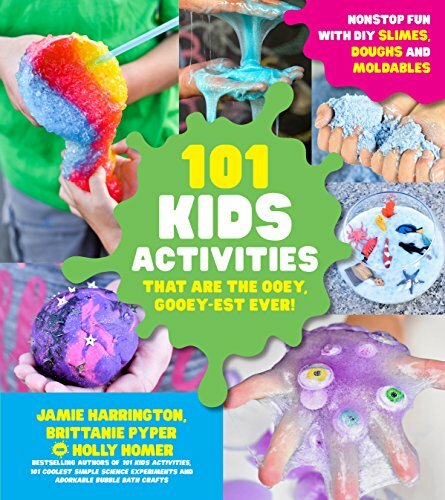 And if your kids really love slime (like mine do) make sure you pick up our new slime book which releases in time for Christmas! 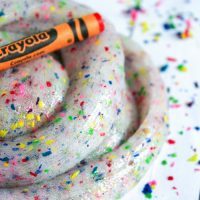 Chose the color crayons you want in your slime. I picked about 8 crayons in different rainbow colors. Add 1 tbsp contact solution slowly. It will instantly begin to form. Note: You may not need all of the contact solution.